Well the big day finally arrived and we were ready for our big adventure. Our bags were packed and we had checked our lists at least a hundred times. Our flight left in the afternoon, but we were not taking any chances this time, so Dad dropped us off at the airport three hours prior to our flight. The lines were almost non existent this time and everything went smooth until Mom got busted at security because she forgot to remove the big bottles of cosmetics from her carry on bag. Rod and I went ahead to Pappadeaux’s to grab a table while Mom and airport security went downstairs to purchase a $10.00 box to put her bottles in and get them checked through baggage. Usually I’m the one that gets stopped by security, so I was surprised when I breezed right through. 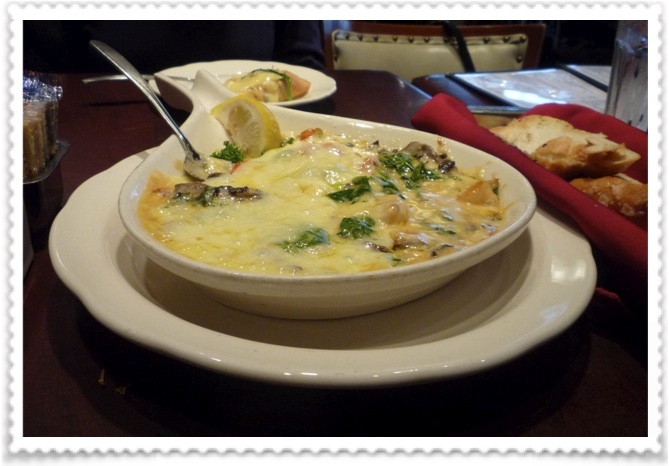 Once we got to Pappadeux’s we were able to relax a bit and enjoy a delicious meal. We ordered a seafood fondue that was to die for. After lunch we boarded our plane where we would connect to Bogata Columbia on our way to Guayaquil. The flight was pretty uneventful (which is always good), until we got to Bogata. Once we got off the plane we had to catch a bus that was standing room only to get to the next terminal. We were directed through the terminal to a security checkpoint and were headed to the next gate when a security officer asked where we were flying to and when we told him Guayaquil he asked where our luggage was. We proceeded to tell him that the luggage was checked all the way to Guayaquil, but he disagreed and told us that we needed to check our luggage again. He offered to get our suitcases off of the original plane and put them on to our next plane. At this point we were thinking there was no way our luggage was going to make it to Guayaquil with us. We were then directed to a gate where there was much confusion amongst the ticket counter employees and the reader board in the waiting area was showing Quito as the destination. By this time we were quite nervous as to whether or not we would make it to our destination, much less our bags. Finally a very nice airport employee came to get us and we boarded another bus to take us to our next flight. 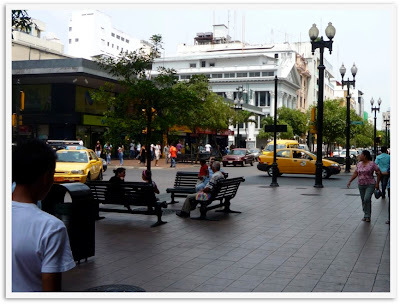 Once aboard the plane we all breathed a sigh of relief when the pilot announced the time that we would be arriving in Guayaquil although we still weren’t sure we would have luggage when we arrived. When we landed in Guayaquil it was 11:40 at night and for some reason the airport was extremely busy. A large plane had landed just minutes before ours and it seemed that everyone on that plane had four or more bags to retrieve and get through security. when you land in Guayaquil you have to first go through customs and then you have to go through security with your bags. We were just praying that our luggage had made it and to our amazement when we got to the carousel, there it was. After waiting in line to get through security we made our way up to the airport entrance hoping that the hotel driver was there to meet us. Once again to our delight there was a driver standing there holding a sign with our name on it. The last trip that we took to Guayaquil we stayed at the Guayaquil Hampton Inn and we have been extremely pleased with this hotel. It is very clean and we have never had a problem with them picking us up at the airport and the complimentary breakfast is very good. After a good nights sleep we got up, ate a good breakfast and waited for Carlos to pick us up to take us to Cuenca.